I have been running short distances for the past several years and have finally decided to tackle a half-marathon. This May, I am running the OneAmerica 500 Festival Mini-Marathon, then this coming September the Hendricks County Half-Marathon. Since I have never run farther than 3.2 miles (until a few weeks ago) and planned to step that up to 13.1 miles, I figured it’s very important to prepare myself. I am following the Hal Higdon half marathon training, which includes runs increasing in mileage weekly for 12 weeks but also cross training. Before getting started, I realized I needed the right tools, not only for comfort, but to make sure I don’t injure myself. 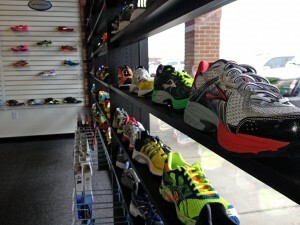 So, I decided to check out the new Runners Forum in Avon, Indiana, to find the right pair of shoes and running clothes. The store is located at 8100 E. U.S. 36, Suite 6, Avon. Runners Forum is unlike your regular store where you walk in and find a shoe that ‘looks’ nice. It’s more of a custom fit. They fit you by looking at not only your shoe size and width but also the arch of your feet. They do a Gait Analysis, which is watching the way you run or walk to make sure you are getting the perfect shoe, and then let you try on a few different types of shoes and run in them to see what is the most comfortable. After being in the store for just a short time, I realized they offer a lot more than just shoes and clothing for serious runners (which quite frankly I am not…yet). They work with everyone from beginners to advance runners as well as walkers and those participating in triathlons. The Runners Forum prides itself on helping its customers stay healthy through nutrition education and classes designed to help runners with their running technique. They also carry a wide variety of clothing, accessories and nutrition products. Their customer service was great, and I can definitely say they have a new loyal customer. After getting the right tools, I then focused on finding safe trails where I could start running long distances. There are all kinds of great trails to run in Hendricks County. Some of my personal favorites are McCloud Nature Park in North Salem when I want a more scenic run and the Plainfield Trail System for a closer, nicely paved run. Another important part of training for my half-marathon is cross training. On the evenings that I don’t run, I attend classes at Totally HIP Fitness. My two favorites are Buda Khi and Kickboxing. I enjoy classes more than lifting weights so it is the perfect option for me. If you prefer swimming and lifting, I would highly suggest the Hendricks Regional Health YMCA in Avon. I am only on week four of my 12 weeks of training, but I have surpassed several of my personal goals. 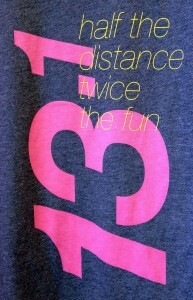 I’ve also found that I really enjoy running, which I never thought was possible. I’m excited to see how I do in the race and the improvements in my health. Happy Trails! !